Instead, I wanted to represent love in its complex glory, beyond whatever pink, fluffy, on-the-surface feel-goodness that we so often idealize it to be. Anyone who's ever loved someone else before--be it your family or friends or significant others (so this is basically everyone, I'd think)--can probably agree that love is at once sweet and savory and simple and complicated and bitter and tart and dense and light and fragrant all together. Love can simultaneously cause delirious joy and be cripplingly and forcibly painful (okay, not that this cake is painful, but you get my drift), and it goes down so much more easily in my experience with a nice, strong, delicate cup of hot tea (or a nice, strong bear hug, whichever one you can get at the time!). And, the oddest, most curious thing about love is that, despite all of its convoluted manifestations, it is the one emotion that somehow manages to provide enough hope to make life worth living. This is what I thought I should be celebrating on February 14. 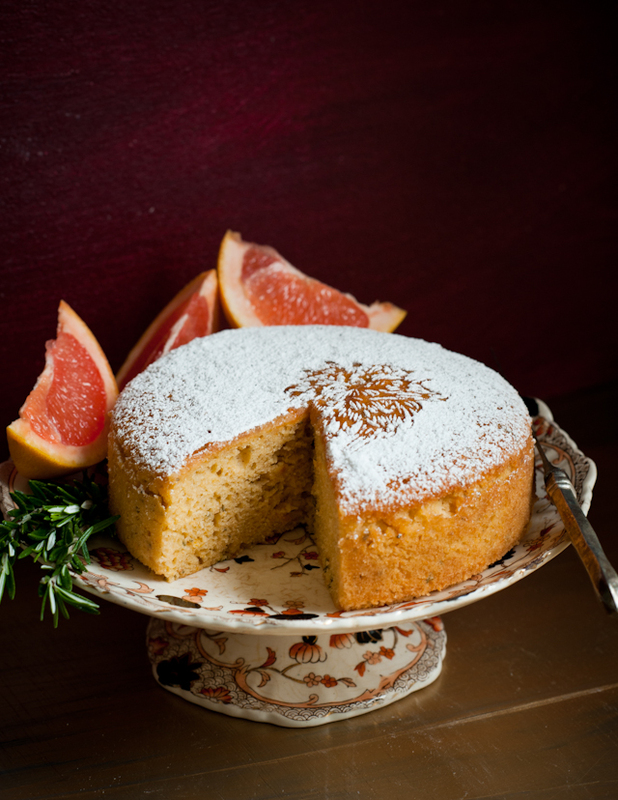 So here it is, this year's Valentine's love cake: a grapefruit and rosemary olive oil cake. 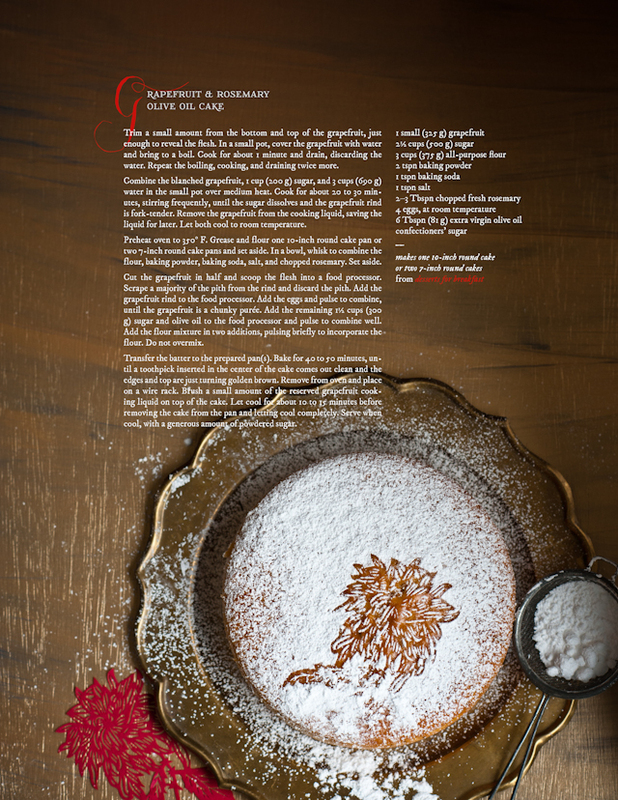 Thanks to the olive oil, the cake is just so in terms of balancing heft and moisture with airy-ness and fluff. The grapefruit provides a hint of citrus and some bite from the zest but also, at the same time, the grapefruit gives the cake a dash of bitterness--just like a strong marmalade--that you wouldn't normally find in an orange- or lemon-based cake. The bitterness is quite well offset by the light glaze of sugar syrup brushed on right after the cake comes hot out of the oven and by the copious amounts of powdered sugar topping that one should serve the cake with. Finally, the rosemary really rounds out the flavor, with just enough complexity to keep an otherwise simple and straightforward cake nicely interesting. In other news, things have been quite busy at work, hence the sad, neglected state of my kitchen and studio lately. Sigh. It's come to that point in time in one's graduate school career when you don't really quite know what's going to happen next: it's a stressful way to live, and I'm terribly eager to figure it all out soon. I'm so thankful that I have this blog to escape to when I need it. Thank you, readers, and happy belated Valentine's! ❤. 1. Trim a small amount from the bottom and top of the grapefruit, just enough to reveal the flesh. In a small pot, cover the grapefruit with water and bring to a boil. Cook for about 1 minute and drain, discarding the water. Repeat the boiling, cooking, and draining twice more. 2. Combine the blanched grapefruit, 1 cup (200 g) sugar, and 3 cups (690 g) water in the small pot over medium heat. Cook for about 20 to 30 minutes, stirring frequently, until the sugar dissolves and the grapefruit rind is fork-tender. Remove the grapefruit from the cooking liquid, saving the liquid for later. Let both cool to room temperature. 3. Preheat oven to 350° F. Grease and flour one 10-inch round cake pan or two 7-inch round cake pans and set aside. 4. 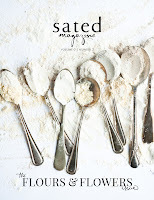 In a bowl, whisk to combine the flour, baking powder, baking soda, salt, and chopped rosemary. Set aside. 5. Cut the grapefruit in half and scoop the flesh into a food processor. Scrape a majority of the pith from the rind and discard the pith. Add the grapefruit rind to the food processor. Add the eggs and pulse to combine, until the grapefruit is a chunky purée. Add the remaining 1½ cups (300 g) sugar and olive oil to the food processor and pulse to combine well. Add the flour mixture in two additions, pulsing briefly to incorporate the flour. Do not overmix. 6. Transfer the batter to the prepared pan(s). Bake for 40 to 50 minutes, until a toothpick inserted in the center of the cake comes out clean and the edges and top are just turning golden brown. Remove from oven and place on a wire rack. 7. Brush a small amount of the reserved grapefruit cooking liquid on top of the cake. Let cool for about 10 to 15 minutes before removing the cake from the pan and letting cool completely. 8. 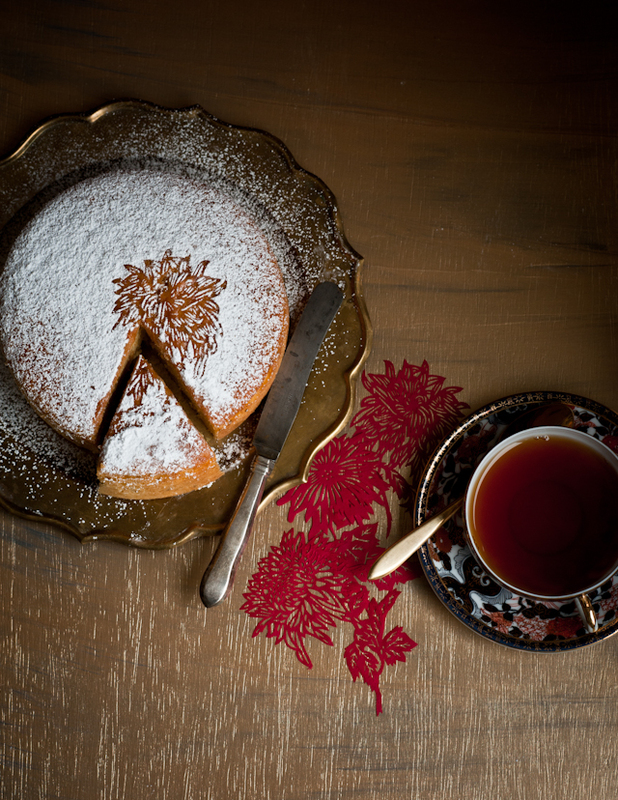 Serve when cool, with a generous amount of powdered sugar. Note: adjust the amount of rosemary dependent on the potency of the herb that you have on hand. 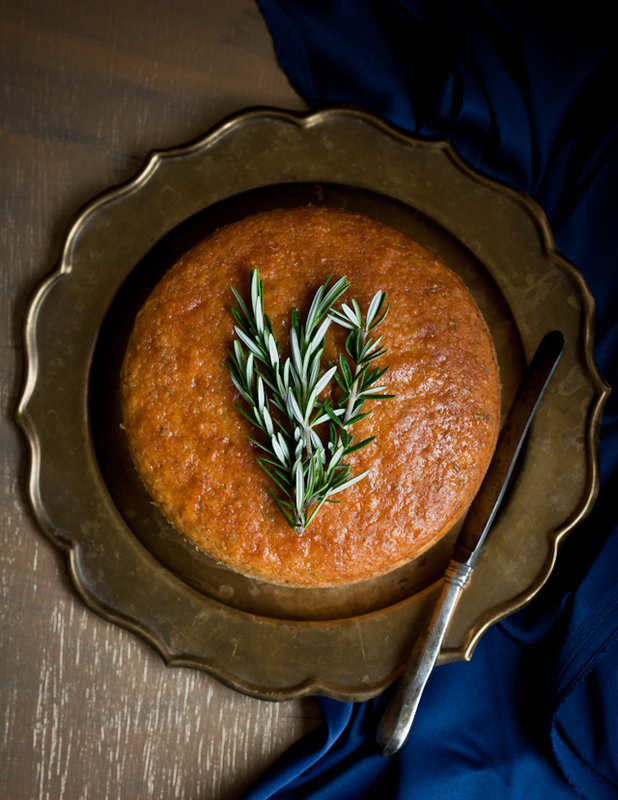 For a cake with lighter rosemary flavor, go with 2 Tbspn. For something more robust, go with 3 Tbspn. I love how fluffy this cake looks, and dusting it with the powdered sugar and stencil makes it look even lighter than air! And you being grumpy due to old age? Puh-lease! Don't make the rest of us feel ancient! Anyways, I'm pinning this recipe so I can use it the next time I'm given a grapefruit. I always receive them as people's bumper crops, but I'm so so sensitive to the bitterness. A good dash of sugar, spice, and everything nice should help! I love your blog! This cake looks absolutely delicious! 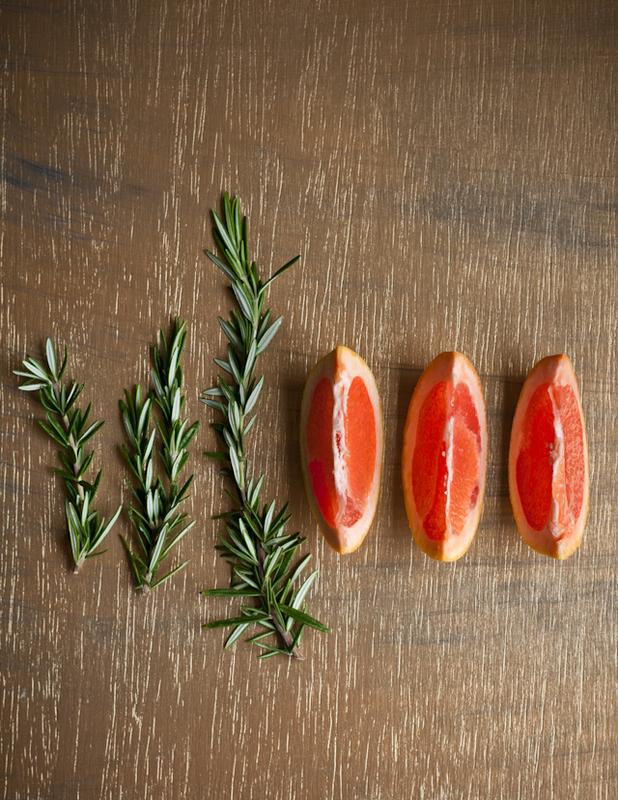 Citrus and rosemary is a beautiful combination. i love the savoury note that it can bring to cakes without making them too confrontingly different. This looks divine for afternoon tea. Love and be love))) With St. Valentains Day! Wow! Your pictures are just stunning - as usual! I love the way you photograph your food. And all those beautiful dishes! I hear you!! I had an overdose of red and pink on Valentine's Day!! On the other hand am quite intrigued by this cake.. am bookmarking it for it intresting flavour combinations!! This cake sounds so wonderful! I love the combination of tart and rosemary together. My husband is also in graduate school, and many of our friends are going through the same "what's next" situation. I hope you get into the exact program you want! Argh, I am so with you on the valentine's day thing. I was soooo over all the pink/red/etc. Instead, I made cinnamon buns, because if the dedication to making those from scratch doesn't say love, then I don't know what does. This cake is just gorgeous. 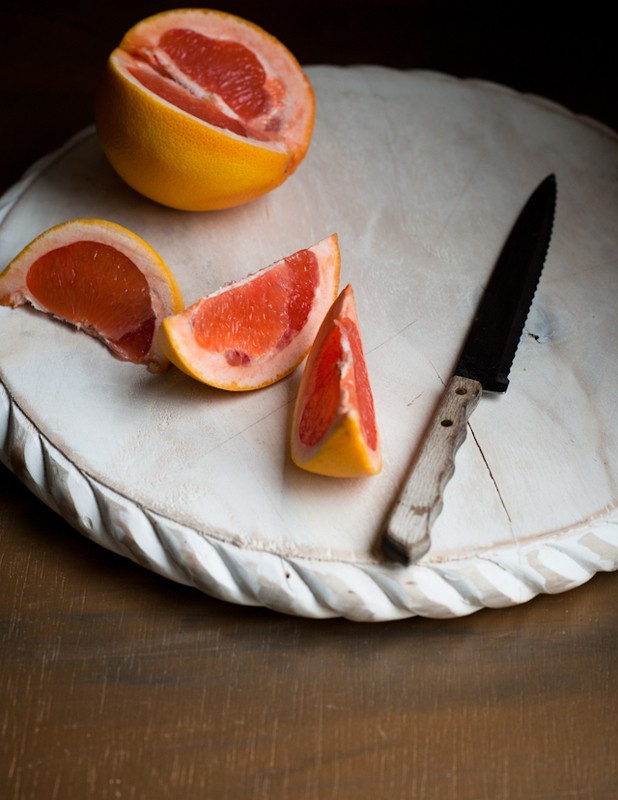 I have a major major love of grapefruit, so I get where you're coming from with this being a valentine's day cake. Grapefruit is the queen of citrus, I've decided. And I can imagine it pairs beautifully well with rosemary and olive oil in cake form. Lovely! I love this! It's so beautiful. I have some meyer lemons, I might just try this soon with them!! Now that is gorgeous! Oh yeah!! looks so deliciousssss. I have never made or tried cake with grapefruit. This is so beautiful, and sounds like a heavenly combination of flavors. Definitely want to make it! Your photos knock my socks off every darn time! 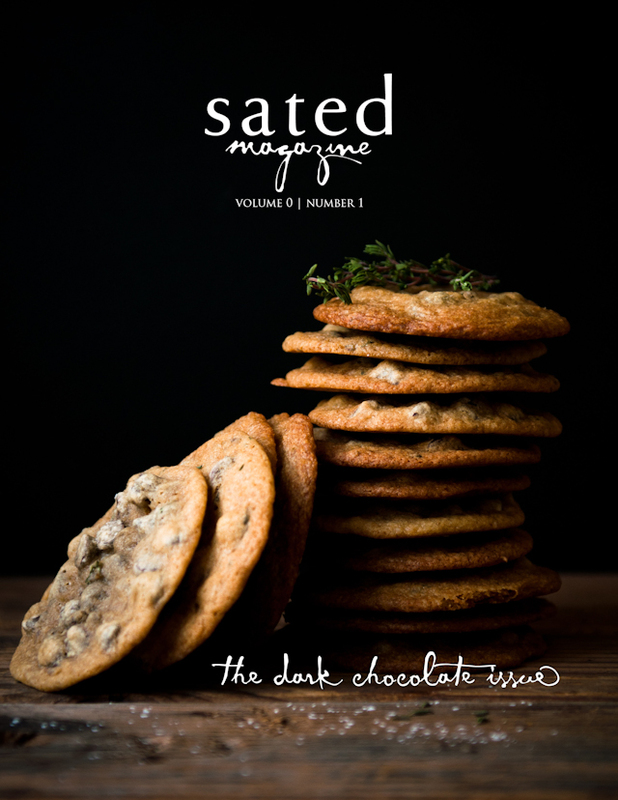 Gorgeous photos, and such a great flavour combination! I'm not really into valentines (although I'll totally eat the free cake that is often around), so I'm liking the subtle valentines vibe of this cake without the need of hearts and sparkles. As always I love your styling (esp the sugar pattern on the cake). Looks so lovely! Can you use dried rosemary if you don't have fresh or will it change the flavor? Woah. This looks so great--I bet the flavor is really delicate and wonderful. This is one to try for a special occasion for sure. Thank you! Your design is so pretty and delicate! I love finding fruit flavored cakes. I think it's because my mom always bought fruit cakes home when I was younger so it reminds me of those times. I love the grapefruit cake in this post. Beautiful photos!